Recently i have read a few articles regarding the research/study on gut bacteria (If you didnt know we have both good and bad bacteria in our intestines and all together those can weigh up to 1,5kg... An interesting fact, for me anyway. For most others they find this information disturbing and something they would prefer to not know. But now you know and also to point out, that we need these bacteria to survive and be healthy. They have found correlations of "bad" bacteria and illnesses or lack of bacteria and illnesses, but then have a good gut bacteria improves health hence why it is recommended to take probiotics!). My mum sent me a link to an article, but i couldnt find the actual article link she sent me so i did some of my own googling and found THIS article which was pretty much the same thing and talks about a study done to see the gut bacteria of those who suffered with anorexia and those who were healthy. And what they found is that those who had anorexia had much less bacteria in their intestines - most likely due to the fact that they were eating so little and non varied and so many of the bacteria died out, but then when the patients had gained weight and been eating enough and varied the bacteria flora improved but not as much as it was as the healthy people. For a long time my mum has talked about how important gut bacteria is and ive always been given probiotics, however i have also taken ALOT of antibiotics in my life. During most of my childhood i was almost constantly on some form of antibiotics either orally or through an IV. And at times ive had to take antibiotics almost every month or second month.... and that does alot of damage on the gut bacteria and can take up to 6 months after just a 2 week antibiotic dose to get back to a healthy gut bacteria again. However antibiotics do help so its not something you should avoid if you need it, but taking it unnecessarily isnt a good idea, and also making sure to take plenty of probiotics before, during and after the dose. In school recently we talked about the gut-brain axis and how bacteria in the intestines can impact and affect the brain and cause issues such as depressive thinking, more prone to anxiety and might even be a cause of an eating disorder. Ive been skeptical... but it also makes alot of sense. I.e if we eat the right food and plenty of fiber which is healthy (in the right amount) it will also feed the gut bacteria. I.e good nutrition plays a HUGE role in how you feel. It impacts thoughts, mood, skin, hair, energy and pretty much everything else in the body. It is very very interesting to read about and one of the conclusions is that good nutrition is key but also that probiotics should be a part of everyones diet. There is also studies about how gut bacteria can affect/be the cause of depression, but more studies on humans need to be done. Article in more "simple wording"
There is also the theory that in the western world everything is too "clean" i.e people arent as exposed to different bacteria and such which in turn can cause autoimmune illnesses. Ive always grown up being told that "a little dirt never harmed anyone" and also that as a child, growing up around animals can actually make the immune system stronger as you are more exposed to bacteria which makes the immune system have something to fight against and get stronger. But on the other side ive also been told that i need to stay away from as much dirt and bacteria as possible because of my CF and wasnt even allowed to hoover or sleep on a mattress on the floor because of the bacteria i might be exposed to. Basically, not all bacteria is bad. There are also plenty of articles and studies showing that the way you are born and whether you are breast fed or not impacts your gut bacteria which later can impact your health status, i.e whether you are more prone to different illnesses not to mention how you maintain your weight. I.e for some people, because they were born from a C section and never breast fed can be one of the causes for weight gain in the future according to some studies. A variety and abundance of different gut bacteria is often found in the healthiest of people which is why HEALTHY AND VARIED FOOD is key. That is basically the summary of it all.... are you eating restrictvly, eating alot of junk food, not eating alot of fiber? 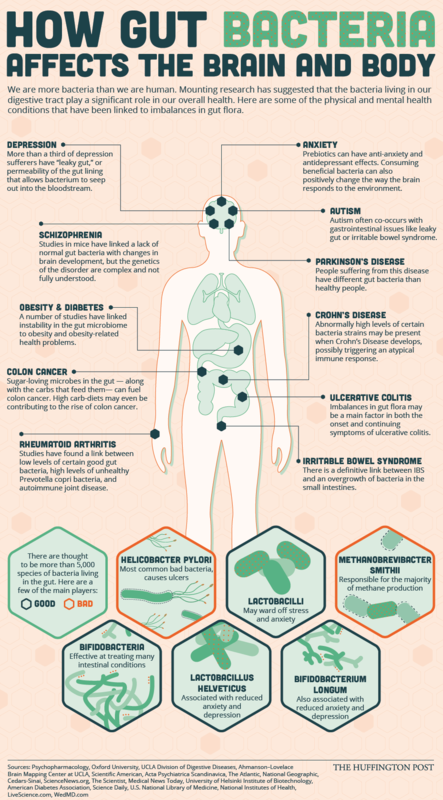 This can all affect your gut bacteria which can then affect your brain and thoughts and lead to other negative impacts. So dont just live on broccoli, dont just live on rice and chicken, dont just live on oreos and burgers... its all about the balance and variety. But also eating enough is key, eating enough to maintain your weight... the less you eat the less fuel for the gut bacteria. I feel like i could write so much more about this as it is a very interesting topic and hope for more studies about this in the future (which i know there will be.) But just keep in mind - eat varied, eat healthy, supplement with a probiotic and dont be scared of a little dirt (ohh... and maybe cut down on animal products would also be a recommendation!!). This was very interesting! Great post and subject :) I take a daily probiotic/pre biotic and I have found it really makes a difference to my IBS. Put it this way, if I run out or don`t take them for a while I really notice the difference. And I make sure I take a special course of probiotics whenever I have to take antibiotics - there are specific higher strength ones you can get especially for this. I watched a programme on tv recently where a young boy was overweight but his diet wasn't found to be the cause. After tests it was found he had insulin resistance and abnormally high blood sugar. He was put on a diet of high probiotic type foods and within a short time after more tests it was found that his blood sugar levels came down and eventually became normal, and the insulin resistance had reversed. He began loosing weight too. Thanks for awesome blog and go you! I wanted to recommend a movie/documentation to you: "Embrace". It's about body image and how there are these stereotypes in society that a women needs to be skinny, have a perfect face, no wrinkles etc. This movie is SO GOOD, I think they should show it to students at school! It opened my eyes and showed me that everyone is beautiful no matter how they look or which size they are. Please, watch it! It's perfect and eye opening! I think that it might help people in recovery accepting their bodies as well (to me it did at least to some extent). Hi there! I love your blog and am so interested in this topic, as I have been experiencing tummy troubles for roughly the past year. I am not diagnosed yet, but I believe I am struggling with IBS (and have also dealt with anxiety-induced bowel troubles since childhood). I am struggling with gaining weight, and was wondering if IBS-D could be a contributor to this? Sorry if this is TMI.. I just fear that there is an underlying component of malabsorption as a result of my probable IBS/ anxiety. Thanks so much! Hi Izzy - Do you think you could write a bit to explain carbohydrates? I saw a programme on television yesterday and they said there were two types of cabs - complex and simple. But they didn't really explain what that meant, just that you should limit them? Also they said that nearly all food had some carbs in it - so how do you avoid/limit them? I`m a bit confused! Good morning Izzy! Hope you are well. As its Friday - just a bit of fun - If you were to have your "dream" vegan meal, what would it be and who would you share it with??? dear Izzy, do you have advice about choosing dietary supplements, eg b12? sorry if you have posted on it before -- I have read lots of posts on vitamins from you, but I don't recall one about choosing supplements, but I may have missed it. Thank you for all your interesting posts! have a good weekend.